Last update: 2019-03-18 | Lang. : EN & CZ | Older versions may contain OpenCandy. Saves your time using simple one-click installation process of favourite modifications and configuration for better FPS! Not any knowledge how things works needed, simply download, procees with installation and enjoy better FPS and no frustrations. Minecraft Tweaker is well known utility for FPS optimization, downloaded by users from all over the world! just a few good reasons to download! Minecraft Tweaker will install modifications in few click, without hassle and create uninstall link in Add / Remove programs so you are able to restore all changes made by Minecraft Tweaker when needed. 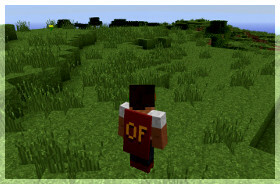 Minecraft Tweaker will install all available mods like OptiFine, Forge (optional), Xaeros’s Minimap Mod (optional), Zan's Minimap Mod (older) and Rei's Minimap (optional), optimizes settings (many types), optimized libraries and more to boost your FPS! 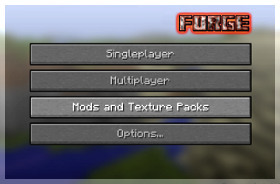 Also feel free to install your favorie modifications after Minecraft Tweaker! You will never miss any updates of the product or modifications. Minecraft Tweaker Updater will get you informed about latest updates. Have you issues with Forge or OptiFine? Have you tried everything without success? No problem! Minecraft Tweaker will try to fix any issues with these modifications during installation process! 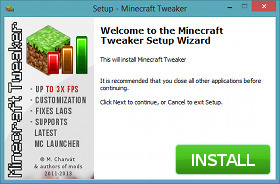 Try to remove Minecraft Tweaker and then reinstall it using right installer according your Minecraft Launcher. Also carefully read text inside the installation. Please make sure that your Java env. is updated. If you want to use older versions of Minecraft Tweaker then please install Java 7 instead of 8. Finally if all else fails, you may contact us or authors of mods (OptiFine etc.). When contacting us, please, try to give us an much details as you can. Copyright © 2012-2019 M. Charvát | Privacy | EULA | Uninstall | Product is not affiliated with or endorsed by MOJANG AB. "Minecraft" is a trademark of Notch Development AB.